We’re continuing our series on the new additions to NCAA gymnastics team rosters, highlighting the Florida Gators today. The Gators had a couple of important contributors graduate last year, including Kennedy Baker, Alex McMurtry, and Rachel Slocum. How they replace these losses will determine how far they can go this year in NCAA competition. Baker had an unfortunate Achilles tear partway through last season, so the Gators adjusted their lineups and got a glimpse of what the roster would be like without her. Before that, she had been competing consistently on vault, bars, and floor, and occasionally on beam. McMurtry was a solid all-arounder for the team for the latter part of the season and was relied on in every meet on vault, bars, and beam. Slocum, meanwhile, was a mainstay in the vault and floor lineups. Although she moved to Florida this summer, that did not stop Trinity Thomas from continuing her elite training and competing at the 2018 U.S. Championships in Boston. Thomas put up a fantastic performance there, finishing eighth in the all-around, and she was named to the national team. Thomas will be traveling to Lima, Peru, to compete at the Pan American Championships in a few weeks. Thomas is likely going to be a key all-around competitor for Florida, potentially stepping up to the spots left vacant by McMurtry and Baker. She can hit on every event, and her execution is always top notch. She has a beautiful Yurchenko 1.5 that she’s been competing at the elite level and improving on with each competition, and she has a lot of difficulty on bars and floor. She’ll likely keep her big opening double layout as her first floor pass for college, and we can’t wait to see her giant release moves on bars. Florida is used to recruiting former national team members, and this year is no different with Sydney Johnson-Scharpf, who was a member of the junior and senior national teams from 2015-16. She decided to compete at Level 10 for her senior year of high school and got some of the top scores at the J.O. level at meets like at the Texas Prime Meet and Kurt Thomas Invitational. Johnson-Scharpf is another gymnast who Florida will want to evaluate on all four events, but she’ll likely be especially useful for the team on vault and floor, where she showed great promise at the elite level and consistently high scores at the J.O. level. At the 2018 Presidential Classic this year, Johnson-Scharpf scored a 9.875 on vault and floor. Another new start who will help fill some of the gaps left in the floor lineup is Leah Clapper from Gym America. Clapper competed mostly at the J.O. level, although she did compete at the 2016 Secret U.S. Classic, as well as the 2017 U.S. classic and P&G Championships. She competed at the J.O. level this year, tying for eighth on floor at J.O. Nationals and ninth in the all-around in her group. She’s capable of opening with an E-pass with a nice double Arabian. Clapper is also really strong on beam. At the 2018 Twistars Invite, she scored a 9.700 for her routine which included a strong triple series. Nya Reed is another freshman who has a good shot at a spot in the floor lineup. Incidentally, she also opens up with a double Arabian and is capable of strong landings and nice dance elements as well. Savannah Schoenherr, from Oconee Gymnastics Center in Georgia, originally committed to Auburn when she was just 13 years old, but she signed with Florida last November. Schoenherr is an impressive Level 10 gymnast who will have a lot to offer on all four events, but especially on vault, where she is capable of a 10.0 start value vault with her Yurchenko 1.5. She is also capable of big numbers on bars. Remember that huge Ray release move that McMurtry would compete? Schoenherr has the same thing, in Jaeger form — her Jaeger release is big and floaty and adds an exclamation point to her already impressive routine. Halley Taylor from LaFleur’s Tampa is a walk-on this year for the Gators. She is capable of some big tumbling on floor, including a double layout, and this would likely be the lineup that she would try to compete for a spot in. 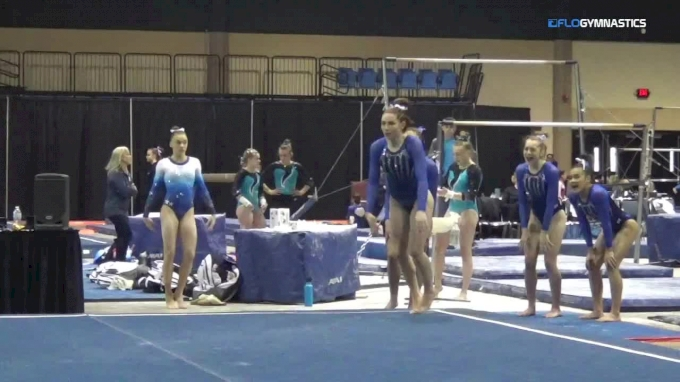 In addition to the incoming freshmen, there are other gymnasts on the team who may be looking to compete in a lineup they didn’t compete in last year, or competed very little in. In particular, a few of the sophomores could likely be used on other events. Alyssa Baumann was a solid competitor on beam and floor last year and competed vault a couple of times. It’s possible she may look to improve on her vaults this year, or perhaps even add in bars to be a potential all-arounder. Jazmyn Foberg is another one who falls into this camp; she competed all-around in her first meet of the season but stuck to vault and bars primarily for the rest of the year. Megan Skaggs, another sophomore, competed all-around once last season and scored an impressive 39.375. She mostly stuck to bars and beam but is definitely capable of big numbers on floor, having scored a 9.925 in her first time up on the event. In the junior class, Maegan Chant is a gymnast we hope to see more of this year. She was limited last year due to an ankle injury but was a key contributor for the team on vault and bars in her freshman season. Fellow junior Rachel Gowey is someone who we could potentially see on all four events; she’s capable of strong scores on vault and floor, although we only saw her sporadically on both. Amelia Hundley is another junior who could be counted on for all four. We didn’t always see her on vault in the past; like Gowey, she competed the lower start value Yurchenko full, but she was known to have great form in the air and great landings on it, so could still produce good scores.